Mark Trumbo has emerged as one of baseball's most potent sluggers. Paired with Mike Trout and Albert Pujols, the Angels have emerged once again as one of baseball's most dangerous teams. Trumbo was picked in the 18th round of the 2004 draft. It took him a while to make it to the Bigs, but when he did, he made a major impact. In 2011, his first full MLB season, Trumbo hit 29 home runs and drove in 87 runs. That has carried over into 2012 and then some. Not only has Trumbo continued to be a premier slugger, but he has brought his batting average way up as well. He has also taken some of the pressure off of Albert Pujols. Trumbo has just two rookie cards. They both come from 2004 products, several years before his debut with the Angels. Usually, these sorts of rookies fall in Topps products. This isn't the case with Trumbo. Donruss and Upper Deck were the only companies to get first-year cards of the slugger. 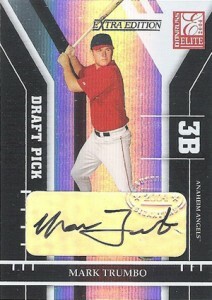 The 2004 Donruss Elite Extra Edition Mark Trumbo rookie card is autographed and numbered to 1321. 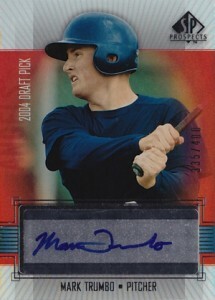 Upper Deck's 2004 SP Prospects Mark Trumbo rookie is also signed but limited to just 400 numbered copies. When Trumbo finally made his debut with the Angels in late-2010, it led to a slew of 2011 cards with the rookie card logo. This is because of rules introduced in 2006 that said a player had to make their debut before they could have fully licensed rookie cards. Unfortunately, these are not Trumbo's first Major League cards. Therefore, they're not rookies. Mark Trumbo rookie cards are his 2004 cards. Over the years, Donruss Elite Extra Edition carved out a niche for its serial numbered rookies. The emergence of Mark Trumbo adds another notch. If it were released today, it's unlikely there would be the generic foil sticker autograph, but that was fairly standard in the hobby at the time. The 2004 Donruss Elite Extra Edition Mark Trumbo rookie card is numbered to 1321. The card also has ten different parallels of varying rarity, half of which are autographed. The 2004 SP Prospects Mark Trumbo has a lot of the same attributes as his other rookie card. It's foil, it has a foil sticker and Trumbo is shown in a generic uniform. The big difference is the print run. The card has just 400 numbered copies. The parallels are also very rare: Gold (#/10) and Platinum (1/1). Trumbo also appears on a pair of triple autographs in 2004 SP Prospects including one where he's paired with Nolan Ryan and Vladimir Guerrero. 2012 Topps Chrome Red Refractor Mark Trumbo Card BGS 9.5.
great write-up. Trumbo has been a beast this year. His power is some of the best in all of the MLB. He doesn’t get as much cardboard love because he is 26 years old. Yet with Trout and Pujols, people can’t help but notice his talents. He already has 22 homers at the all-star break, and the longest average distance for homers in the majors this year! Wow so if I understand 2011 rookie cards with the logo rookie is not is real rookie haha wow not sure topps company will be agree with that or the collector… plus the fact you said after 2006 the player have to play before so ? 2011 should be is rookie cards. Sebastien � His first cards came out in 2004. Both are base cards in MLB sets. The MLBPA changed the rules following 2005. Ultimately, it’s up to individuals what they consider a rookie and what’s not. In a lot of instances, for current sets, they’re moving towards the first Bowman Chrome autographs. Technically, they’re prospect or pre-rookie cards but they are more actively traded and valued on the secondary market than the cards that get the rookie card label a year or two later.